Last year, several SLPs in my district attended a fantastic conference by Gail Van Tatenhove. By the end of the two days, we were ready to make some district-wide changes to AAC in our district. Although I have been using core boards and core vocabulary for years, this was going to be a radical collaborative effort. Students who start learning core vocabulary with me, would move onto the middle school and use the same words and the same board for cohesive learning. We worked together to use researched core words and determine the size of our “beginner and intermediate” boards. We had to balance the need for students to fully communicate with what we felt staff could handle and support. Not everyone, however, has been excited about the core vocabulary boards. Instructional assistants, parents, and some private SLPs who work with my students have been less than enthusiastic. These doubts have helped me to take a more balanced look at core boards as a form of low tech AAC. Easily accessible: Most frequently used words are are found on board easily and without flipping pages or going into “folders”. Combining words: It is simple and easy to combine core words with a core board! Portable: One page makes it very portable and easy to carry around, hang on a lanyard, or have in multiple locations. Motor pathways: I know that I learn sequences with motor planning. I cannot tell you a phone number, but I can type it out exactly and correctly on my phone. Core boards where the words/pictures never change locations are perfect for learning these motor pathways. Variety of vocabulary: A good core board will include pronouns, verbs, adjectives, prepositions, and possibly nouns (nouns are often best for fringe vocabulary since they change depending on setting). Limited vocabulary: A full size core board will have around 120 words. That may seem like a lot when you are learning to use it, but most people have a LOT more to say than 120 words. Difficult to see: The more vocabulary words that are included, the more difficult they are to see or point to. A core board of 120 words seems impossibly small to a less familiar user. Slow: It takes concentration and time to quickly find words (since they are small and there can be many on a page). Even when the core board is only 24 words, it takes time to scan through it trying to remember where each word is. Overwhelming: A large core vocabulary board can be extremely intimidating – especially to staff and families. Ironically, the AAC users often feel less overwhelmed! When supporting communicators are not willing to model and teach the board, the AAC user is unable to learn its use as well. 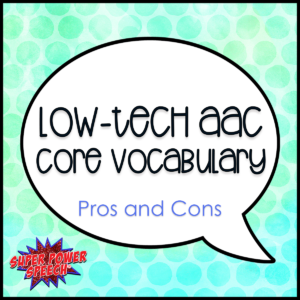 Have you used core vocabulary boards? What do you think? What additional pros and cons would you include on the lists?